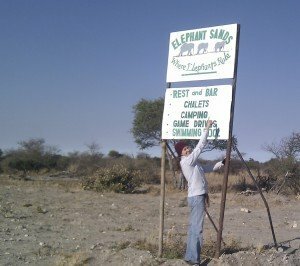 “Who ever see’s the first elephant, doesn’t have to do the dishes tonight” Dion dared Jane and I, as we drove into Northern Botswana. “Game on!” I declared, watching eagerly for my first sighting of some wild animals besides the warthogs we caught a glimpse of in South Africa. We’d passed a road sign warning of elephants, and were nearing our stop-over for the night: Elephant Sands. The conversation had also been touching, during our 12 hour journey, on plans for the expedition, and what we were hoping to be ready to do by the time more of the team arrive later in the week, including the film crew. As Dion distracted me with checking our Garmin, he also shouts out “elephant!” and with a chuckle, I realised I’m doing the dishes. 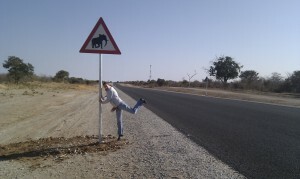 We turned off the main road, leaving the copper trucks grinding down from the DRC, and see the “warning” sign: Elephant Sands – where the elephants rule. The Connect Africa van just made it through the thick sand as we arrive a few hundred metres along the windy road, at the campsite. Setting up camp involved putting out the table and two chairs, pouring some G & T’s and collecting the fire wood. We found lots of pieces, possibly left by the elephants, of the wag-a-bietjie bos (the wait-a-bit thorn bush), called that for good reason, as Jane found out the next day pulling a thorn out of her leg. 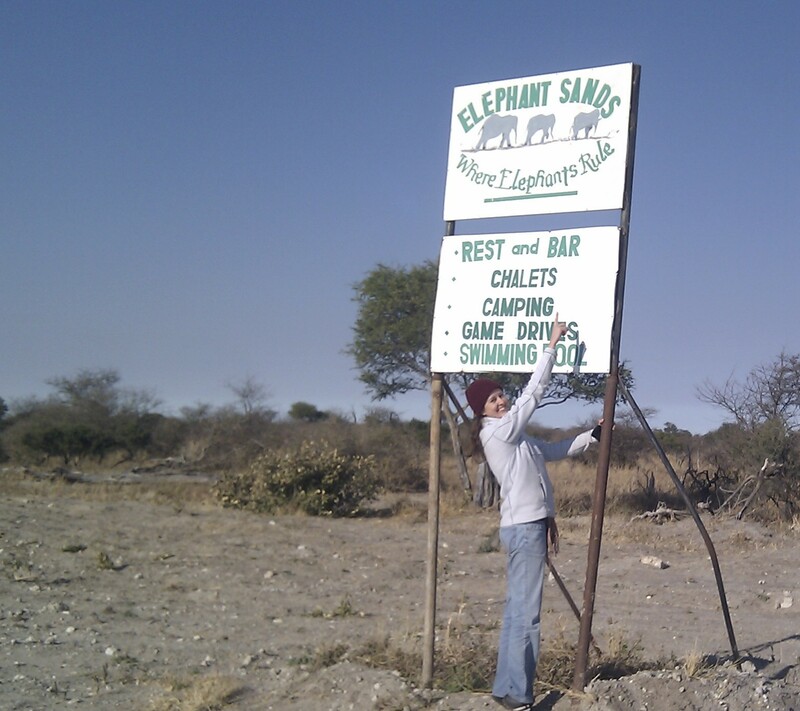 Even in this sandy place, off the beaten track, with nothing between us and the wild elephants, technology is around: the satellite TV is showing the Bulls playing rugby and you can hear the commentator and crowds, and hence half the campsite are missing the elephants. Later that night, we lay in our sleeping bags under the stars, wishing to hear the sounds of the bush, rather than the rumble of the occasional truck passing on the main road, and the hum of the generator powering the few lights, which obscure the full effect of the night sky. After drifting off to sleep by the campfire, we were woken later by a loud wild roaring-trumpet of a noise, which sounded like it was a few metres away from us. We wondered if it was the roar of a lion, sparked by Dion’s imagination from his interrupted dream of shoo’ing off lions from our campsite. Then I notice the graceful movement of an elephant to our right, as it softly walked away from the camping area. As I settled back into my sleeping bag, pulling my beany over my ears to keep warm, I realised that the lights were out and the generator was off. The silence of the bush, with just the occasional snap of a twig under an elephants foot, with the spectacle of the milky way above me, was my introduction to being on expedition in Africa. This entry was posted in Palace Expedition and tagged elephants by CA. Bookmark the permalink.